The 3 separate Type A polygons have 27 sectors with 30 corners. When the root edge is considered as separating the two sets of polygons, one of its two endpoints (formally a corner) can be associated with each set. Hence, 31 corners can be associated with the root edge and either set of polygons.This is the number value of EL ("God"), the Godname of Chesed. The value 1 of aleph denotes either endpoint and the value 30 of the letter lamed denotes the 30 corners of the 27 sectors of either set of 3 Type A polygons. According to Table 2, the number of yods in the 3 enfolded Type A polygons = Y1 = 157. Associated with each set of polygons are (157−2=155) yods, where 155 is the number value of ADONAI MELEKH, the complete Godname of Malkuth. The number of yods in the (3+3) enfolded polygons = 2×155 = 310 = 31×10. EL with number value 31 prescribes their yod population. The 3 enfolded Type A polygons have 157 yods. 27 hexagonal yods are at the centres of the 27 tetractyses. (157−27=130) yods line their 52 sides. (130−3=127) boundary yods surround the centres of the 3 polygons. 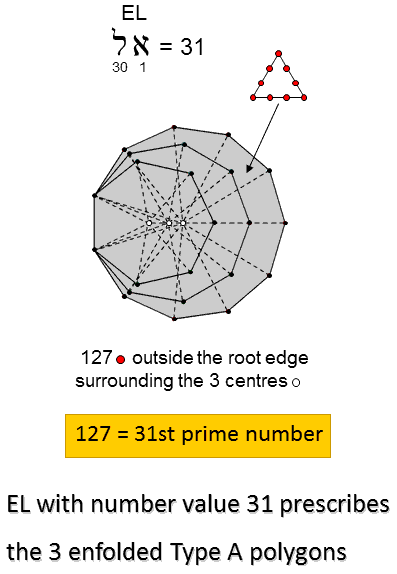 127 is the 31st prime number. 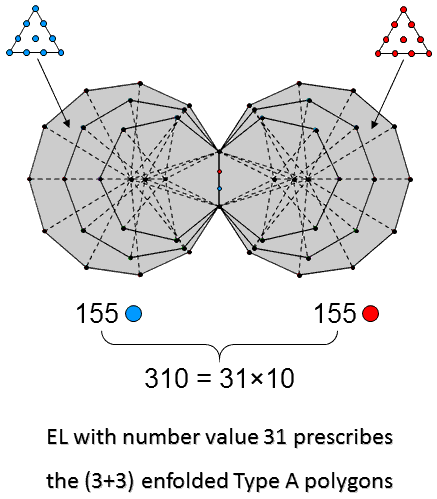 EL with number valuen 31 prescribes the 3 enfolded Type A polygons.